The head of the 14-foot female oarfish found in Oceanside, California. 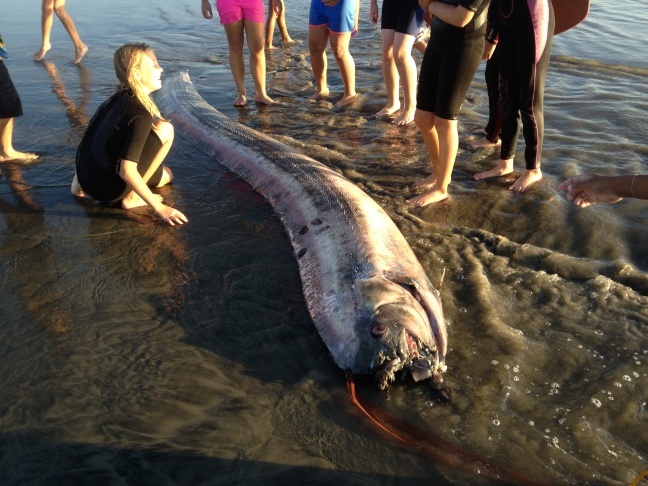 The body of a 14-foot female oarfish washed ashore in Oceanside, California. The tail of the oarfish found on an Oceanside beach on October 18, 2013. The 14-foot fish had to be broken into pieces in order to be moved from the Oceanside beach it landed on. An oarfish spotted in Oceanside Friday afternoon, Oct. 17, 2013. This one is a bit smaller than the Catalina one found earlier the same week. 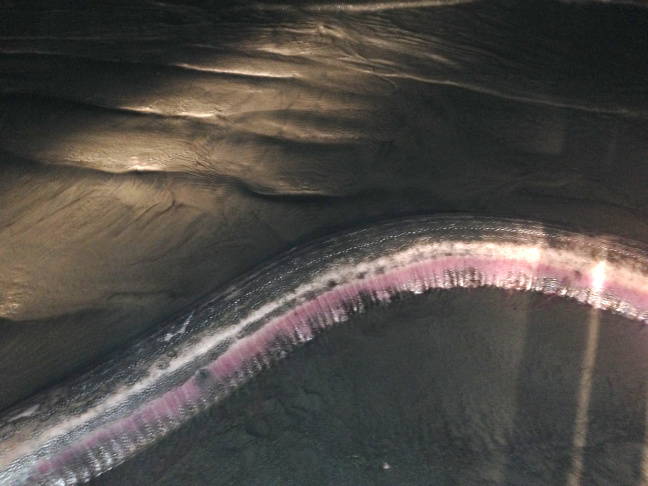 It's still a mystery why a second giant oarfish washed ashore in Southern California, less than a week after another one of the rarely-seen creatures was found. 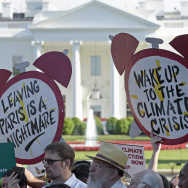 But scientists say they'll be seeking clues when they dissect her 14-foot-long carcass Monday. That's right -- this oarfish is a she. "We actually found some eggs that oozed out of her when we were moving her," said Suzy Kohin, a La Jolla-based fisheries biologist with the National Oceanic and Atmospheric Administration (NOAA). "They looked like tiny, round gelatinous balls. 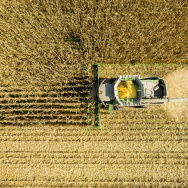 They were probably 2 millimeters in diameter." Even this bit of information intrigued scientists, who know very little about the world's largest bony fish, because they travel in the ocean's deepest waters, making them difficult to study. Because it's so hard to get specimens, scientists still have a lot to learn about the various species of oarfish, and this latest find may help illuminate the differences. Besides trying to understand how the oarfish in Oceanside died - likely because of natural causes, Kohin said - scientists plan to test the carcass for radiation. Fish caught in California waters have been found to carry trace amounts of radiation from the Fukushima power plant disaster in Japan. If radiation is detected, scientists will get an idea of how far the oarfish migrates. 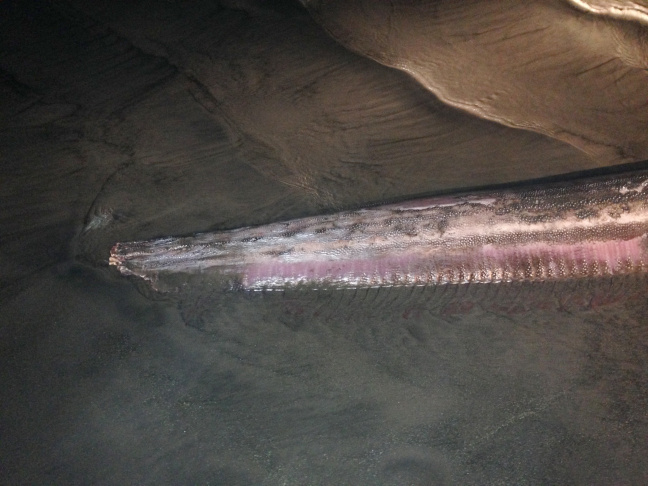 Kohin rushed to retrieve the dead oarfish from an Oceanside beach Friday evening upon learning lifeguards "were going to dispose of her right away because they don't like to keep rotting fish on their beach." To transport the fish, Kohin cut the body into four sections, "because it was unwieldy," she said. "I couldn't take it in one whole piece. So, each of the pieces I cut her into were probably 50 lbs." The discovery of the oarfish at Oceanside comes just days after swimmers off Catalina Island discovered the carcass of another oarfish measuring 18-feet-long. 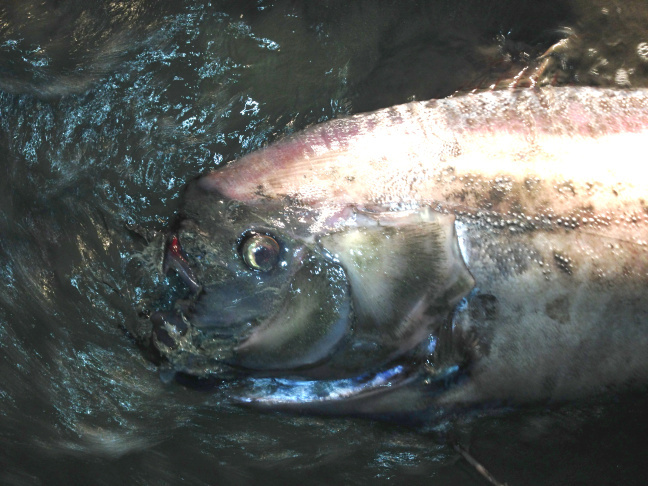 One marine expert hypothesizes that rugged waters may have killed both oarfish. As a species, oarfish have poor musculature and can be poor swimmers. Milton Love, a marine biologist at the University of California, Santa Barbara said an errant current may have brought the oarfish into near-shore waters which tend to be choppier. "These animals probably can’t swim against turbulence and basically they’re carried — struggling but passively — into near-shore waters and just bashed into the surf or into the bottom," he said. Another enemy of oarfish are sharks, and indeed the oarfish found in Oceanside had the bite marks of a cookie-cutter shark, a species of small dogfish shark. But NOAA's Kohin said that it's unlikely that a cookie-cutter shark did major damage to the oarfish. "[The bites] basically look like a cookie cutter has a punched a little hole inside of the fish and they're scarred over but they don't really seem lethal at all," Kohin said. Cookie-cutter bite marks can be found on all kinds of large deepwater fish, and were actually discovered on the body of a rare Stejneger's beaked whale that washed ashore in Venice Beach on Oct. 15. 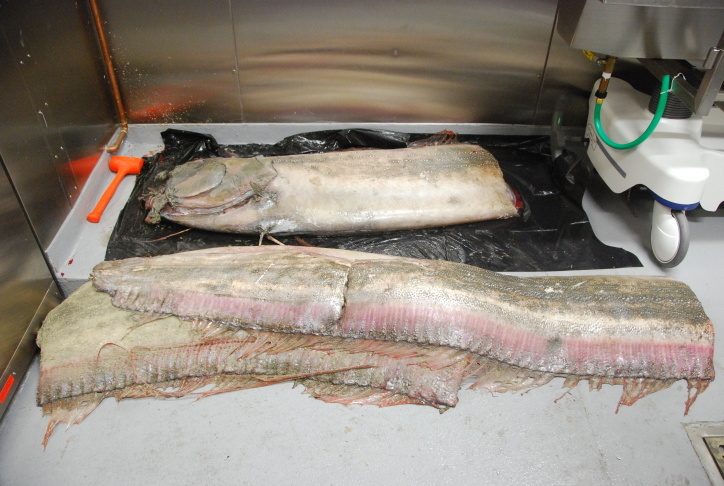 Scientists are eager to get their hands on tissue samples from the two oarfish carcasses. Love said he has requested tissue from the oarfish found off Catalina Island, and is interested in comparing its DNA to that of other oarfish species. "The leading thinking until about 15 to 20 years is there was one species and it’s found all over the world," Love said, referring to discoveries of oarfish off Norway, Great Britain and South Africa. But now, Love said, scientists believe there are multiple oarfish species, at least one in the Pacific and one in the Atlantic. "If we can get tissue from both of the specimens, we can compare the DNA of animals that had been taken in the Atlantic for instance," Love said. In the meantime, Kohin said other scientists have expressed interest in getting samples of the oarfish from Oceanside. "This is a very exceptional situation for us and we're very happy to have this specimen," Kohin said.